In today's world your smile is important. It's one of the first things people notice when they meet someone. A whiter, brighter smile is beautiful - it can help you feel better about yourself and make a memorable impression, it can help you in your professional and personal life. Lifestyle, aging process and many other factors can stain and darken your teeth. Many things we do on a regular basis can contribute to stained teeth, such as drinking coffee, tea, cola and red wine or smoking. Some medications, such as tetracycline are also known to stain teeth. Dr. Kinga offers two teeth whitening systems: in-office and take home. 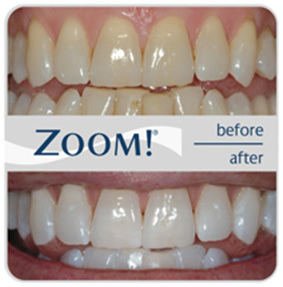 In-office tooth whitening procedure involves the use of Zoom lamp, which speeds up the bleaching process by activating the hydrogen peroxide whitening active agent. In result, the hydrogen peroxide is broken down and oxygen spreads throughout the dentin and enamel to whiten the discolored areas. The process takes little over an hour. Zoom hydrogen peroxide gel is applied on your teeth. The gel stays on the teeth for about 20 minutes while the light is activated; than gel is removed, new gel applied and whole process is done in three sessions. With an occasional touch-up at home and proper care you will maintain your whiter smile. Take home whitening kits available from Dr. Kinga contain a high concentration of hydrogen peroxide or carbamide peroxide and provide excellent results in 1 to 2 weeks of prescribed use. The process involves custom-fit trays (in contrast with one-size-fits-all trays available over-the-counter) to keep the whitening solution on the surface of the tooth to be whitened, and prevent exposure of the solution to the sensitive gingival area. Trays need to be worn for couple of hours daily, and will not interfere with your life.